A few noteworthy individuals have come from Iowa. Herbert Hoover, the 31st president, was born in West Branch, Iowa. The Oscar winning actor John Wayne was born in Winterset, Iowa. The crooner Andy Williams was born in Wall Lake, Iowa. 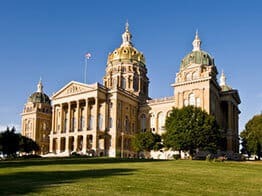 All three at one time or another could have used our Iowa car shipping services. As Iowa auto transport drivers roll their trucks through Iowa, they will see an abundance of cornfields. This is because Iowa belongs to the Corn Belt, and most of America’s corn is grown there. When transporting your automobile across the state, they’ll pass by several farms and small towns. Vehicle shippers will cross a bridge at some point where Iowa is bounded by the Missouri and Sioux Rivers to the west, and then the Mississippi River to the east. Iowa’s capital and largest city is Des Moines, which statistically is one of the safest places to reside. Des Moines is an excellent spot for vehicle shipping as it is located right on east-west interstate 80, and also north-south interstate 35. However, there are few other prime vehicle shipping locations in Iowa. But that’s not to say it’s impossible to ship a vehicle into or out of the state. It makes it easier if you’re shipping a car into or out of Des Moines, as not only is it the state’s largest city, but it also sits along the only east-west interstate corridor. Running through the upper Midwest, I-80 passes through smaller metro areas that are spaced far apart, and with a lot of open distance between potential customers there’s more fuel being spent from city to city, which ultimately raises prices for shipments. You may be able to transport your automobile on your own, but you probably will appreciate the assistance of a qualified car shipping company. Whether you’re visiting family in Iowa, sending a car to a college student or relocating, take advantage of an auto transport service like Direct Express and preserve the condition of your tires. Also save on gas and prevent other possible damage to your vehicle by shipping it instead. You can call our toll-free telephone number at 800-600-3750 to speak to one of our live Iowa car shipping service representatives who can answer your questions and explain more about the auto transportation process. You can also visit Direct Express Auto Transport to fill out a simple form and get a free car shipping quote. We make it easy to book your vehicle shipment online.